My daughter, Fernanda Rubí, was out with friends when she was kidnapped by drug cartels empowered by the money they make from trafficking banned substances. Rubi was just 21 years old. I believe that the prohibition of drugs is the main factor behind this violent situation in my country. Because drugs mean money. In fact, the illegal drug market is so profitable such that even those with the most authority are involved in the drug war. Even those with the largest salaries allow the cartels to operate, so that they can make more money. Mexico has been plunged into terror, and now our children are turning to crime because they are promised weapons, or money, or a car in return. The cartels are taking all of the young people from us; barely a day goes by without the murder or kidnapping of a young person. But my daughter is more than a statistic. She has a name, she has a face. She is a beautiful girl and so full of love, with huge dreams and aspirations. I miss Rubi like you can’t imagine. Her family miss her so much. We remember her every single day; we love her and we will keep loving her forever. 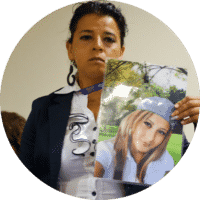 Drug-related violence affects everyone in Mexico and until the law changes, the next casualty of the drug war really could be anyone’s child. Families like mine, who have lost everything to this war are campaigning for legal regulation, to help save lives, and get drugs under control. I hope Rubi knows that I have never stopped looking for her, that I love her and I will find her. To learn more, please visit Anyone’s Child Mexico the interactive documentary. Hear directly from the families on the frontline of the drug war calling for safer drug laws.